Rebecca Robinson and Timothy Burr bonded over their love for God, fun and life and have been inseparable ever since their first meeting while studying at Westminster Theological Centre. They tied the knot at Crossgate Church in Preston on June 30, which is the church where Rebecca leads the youth group. Rebecca, a local youth pastor, said: Our vision for the day was joy, family and Jesus at the centre. After a year together as friends, they went on their first date to Hollywood Bowl and a year later Tim proposed. 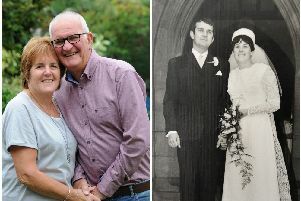 Their engagement lasted six months and they had a lot to do, particularly for Rebecca who had to plan a move to Manchester to live with Tim after the wedding. As Rebecca is a local youth pastor, she wanted as many young people involved as possible, so they helped set up, painted signs, sang and gave out confetti. During last song all the youth were at the front dancing and we had huge rainbow streamers. They held their reception at Arkholme Village Hall with games and a barbecue menu. “We prayed for every guest that came and we wrote them each a note in their place card as a favour,” said Rebecca. “The day was so much more than we could have dreamed, it was so joyful and fun and everyone we love was in one room – it was amazing. 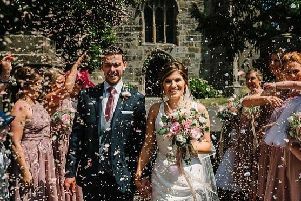 Tim, a church leader, added: “We absolutely loved planning our wedding together.